This is 16 Great Tips for Setting up a Workshop in the Garage. In this post you will learn the best ways to ensure that you have a functional, safe, and enjoyable garage shop to call your own. Even in a garage, you can do several things to make it a perfect workshop. Most woodworkers end up in garage shops. The garage is a common feature in most homes, and typically becomes the first place that a new woodworker turns into a shop. There area lot of good reasons to make a garage shop, with the first being ease of use. Most garages have a couple outlets, easy access through the overhead door, and nice open spaces. This makes them very attractive as a workshop. The area is inside the house, out of the elements, and easy to take over. In most garage shops, there are limitations however. The purpose of this guide is to help you avoid those limitations by making some good choices in the beginning. If you address these few things early in your garage to workshop conversion, it will make all the rest of the time you spend out there that much more enjoyable. You don’t have to do all of these of course. However, at least look at them all so you can make a good decision. You are going to be spending a lot of time in your shop. Make sure you make it as comfortable as possible. Enjoy. Ideally, when you set up a workshop in the garage, you get to start with an empty canvas, or your case, an empty garage. This is the easiest starting point, and it makes all of the following decisions and processes much easier. 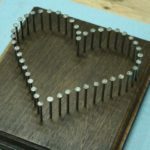 You don’t need to plan everything from the drill press to your last drill bit. However, you should place all of your major tools and at least have storage areas in mind for your hand tools and smaller things. Starting with the empty garage, plan out everything on paper first. Get some graph paper, and draw out the shape of the garage to scale. Then, start planning for the placement of your tools to scale as well. You don’t need to go nuts about this part of the process, but having this initial paper sketch will help you as you make decisions later for power and lighting. It will also help with major tool placement, where to store tools, and other big decisions. Keep your workshop diagram with you, and you can draw right on it as you add things, move things, or take things away. Once you are done, you will have a perfect plan for your garage workshop, and it will be much easier to implement than without. Once you have an idea of where your tools are going to go, now it’s time to add up all of the power cords that need to be plugged in to make it all work. After all, it’s very important to be able to flip a switch and have your tools turn on. You also want to do it in a way that doesn’t overload or trip a circuit breaker. Running power to every tool in your shop is important, because plugging and unplugging things all the time is a huge waste of time. It also involves you bending over, can cause fatigue, and will leave you frustrated over time. Especially when things are not going very well in the shop, having to mess with power every time you need to use a new tool can be infuriating. Use this time right now to plan for your power needs. Make those needs a reality before you add in all of your tools. An easy way to add more capability without paying an electrician is to use a power strip to increase the number of tools you can plug in. If you only use one tool at a time, you can have many plugged into the same power strip and you should not have any problems with the breakers tripping. Another good way to add more power is to get a quote and see what it will cost to add more outlets. You can tell the electrician that you need them to be on different circuits because of the high power requirements of your tools, and that will help them bring in the best solution. Either way you go, make sure you have power for everything that will be used all the time. The random tools that only come out once in a while for special things are different, and you can plug those in as needed. The major tools however, all need to turn on when you flip the switch. If you are struggling with the workshop layout for your garage, start with the major tools first, and place them on your drawing. 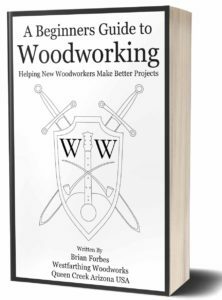 For many shops, the bigger tools like the table saw, miter table, band saw, and jointer all need to be in certain places to work well. These are also center pieces for most shops, though yours may be different. If you look at the requirements for these tools, they almost place themselves. For example, if you have a 220v outlet and you need to place your 220v table saw, you might only have one place that you can put it. In a case like that, place the saw so you can use it easily, but also place it near that outlet. Once the larger tools are placed on your diagram, you can start placing other tools, benches and anything else. You will find that with the bigger tools already in place, it makes placing the smaller tools that much easier. Think about your outfeed table for each tool too if you are planning on using that kind of setup. Smaller tools, and tools that you might not use all the time can have a little different treatment than your bigger tools. For example, you may have a thickness planer that you only use once in a while. You don’t need a permanent place for it, you only need storage systems keep it safe until you need it. In this case, build some storage racking or benches where you can place your medium sized tools, and store them until they are needed. The top of the bench can even be the storage location, though under the bench works well too. You may have several tools like this, and under a long bench is a perfect place. When you need the tool, all you have to do it bring it out and put it on top of the bench. Plug it in, and you are off to the races. This also helps conserve wall outlet space, especially on an item that you rarely use. As you place your tools in the shop, pay attention to the space requirements. For example, you don’t want to have a table saw that is too close to the wall on the front or back. When this happens, it can make feeding or removing material from the blade very difficult. You might only be able to feed a piece that is a few feet long on the table saw if the exiting wood hits a wall. It can also be very dangerous too if it hits the wall unexpectedly and you lose control of the piece. A band saw needs clearance too, and so does a miter saw. all of your tools in fact will need to have a certain amount of space in certain places to work well. As you do your drawing, make sure that you keep that in mind, and plan accordingly so all your tools are easy to use. 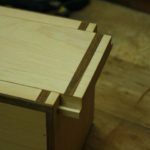 The last thing you want is to have only a four foot length limit on your miter saw, or only be able to joint a three foot board due to bad placement. Look in your users manual if you need some help, or watch some videos on setup. They will help you nail it the first time. The nice thing about the garage is that it’s a big open space. This means creating long benches for your tools and as a work area is very easy. The easiest way of all is with 2X4’s and plywood, which is also inexpensive. Your benches are important. They hold your tools, give you a space to work, and provide structure in your workshop. Plan your benches for the tools that you need to place, and you can have a lot of work area for a very low cost. Plus, they are great for small shops. Look online for some 2X4 bench plans, and you will find a lot of great designs. Pick out something easy to make, and design your own benches for the shop. Using common construction grade materials, the cost is low, and the benches are very strong. Unless you have a gigantic garage, you are most likely confined to a single our double car space. When compared to a traditional wood shop in a dedicated building, it’s on the smaller side. That’s ok, because peg board is your secret to saving space in a garage shop. Peg board does something that is often overlooked in the work shop. It allows you to store things on the walls, which before the peg board was a dead space. This means you need less room for larger tool boxes, storage areas, or carts. There are pegs for nearly any kind of hanging need. You can empty out several tool boxes onto one four by eight sheet of peg board. Once you do, the space in your shop will open up. You will have less tool storage taking up floor space, which is good. Peg board is easy to install. Just make a frame from 1X2 lumber with a couple uprights on the back side, almost like framing a wall. Make sure that the placement of the uprights allows you to get several of them into wall studs when you hang the peg board. Anchor deep into the studs where you can, and use wall anchors to secure the other frame elements. Now, you have a secure and strong peg board for hanging tools. You also save a ton of shop space. The lighting in your shop makes a safety difference, a quality of work difference, and believe it or not a psychological difference in your shop. Poor lighting can cause many problems. It’s silly because great lighting can be had for a very small investment, like less than $100. Natural light can be added too by just rolling up the door. Poor lighting is unsafe. Period. When you can’t see well, and you work with tools that can cause severe harm or death in an accident, you are taking an unnecessary risk. For the cost of some LED shop lights, gambling with your fingers is not intelligent. Lighting also has an effect on the quality of your work. For example, as you sand a project, it’s important to find all the scratches and remove them before finishing. In an environment with poor lighting, you will have a harder time. This means poor looking projects once they get into an area with good lighting. Finally, low light and dim light have a negative psychological effect. When you work in a dim, dreary space, you tend to start feeling the same way. The space is not inviting, and over time you will come to resist going out into your garage work shop. Lighting makes the shop inviting. There is a reason that stores, displays, cars, and every product every sold is cast in a bright light. When something is well lit, it has a positive effect on your mind, and causes you to be more comfortable. I recommend that you go on Amazon and look for LED shop lights. These are super inexpensive now, and they are easy to install. They last a very long time, are very bright, and they make your shop more inviting and comfortable. the best part is you can do the whole shop for about the same as a nice dinner for two. For smaller areas, you can buy task lighting, which are essentially smaller and more dedicated lights. These are common for bench tops, and tool tops. Depending on where you live, the temperature in your shop may need to be controlled in order to make the shop comfortable. For those that live in places with cold winters or very hot summers, having a way to adjust the temperature is important. I live in Arizona, so getting a through the wall air conditioning unit for my garage shop was like a gift from God. It doesn’t really cool the shop down like it would cool the house down, but it does take the shop from over a hundred degrees to the low 90’s, which is appreciated. If you are in a place with a very cold climate, think about investing in a space heater. There are a number of small heaters that you can buy, and they will warm up the space quickly. Make sure that you look for a unit that is rated for use indoors, and follow the safety recommendations. Whatever your reason for changing the temperature in the shop, it’s well worth the investment, and it will make you a better woodworker. When you are comfortable, you work better, and when it’s very hot or very cold, you don’t work as well. 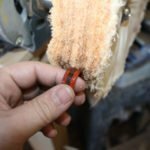 There are a lot of ways to address the dust accumulation that happens in a work shop, and you have a lot of options. You can get a dedicated dust collector and plumb out all your tools, or you can run on a vacuum and move it from tool to tool. Even small projects can benefit from dust collection. It’s not just the big stuff. In the beginning, the most inexpensive way to incorporate a little dust collection is with a regular shop vacuum that can attach to your dust ports on your tools. There are a bunch of fittings you can buy, and it’s pretty easy to get everything to connect. You other option is a larger dedicated collector, which you run pipes from and connect all of your tools. This is a more permanent option, and it works without moving around a vacuum or changing fittings. The down side is the price, which will be quite a bit more once installed. However you address your dust, make sure to have something in place. The garage work shop can get overrun with piles of sawdust quickly due to the small size. Before this happens, and you end up cleaning for a whole day, at least start with a vacuum and attachments to capture as much dust as you can. The nice thing about a garage shop is that you have an easy way to get bigger items like sheets of wood into the shop. That being the garage roll up door. However, you do need to plan a little when you set up your shop if that’s going to be your access point. Some shop designers end up sealing off the garage shop door when they design their shop. It’s more energy efficient, makes for a more even temperature, and makes the shop appear more permanent. That’s ok, but think about how you are going to get your materials in the shop. Also, think about how to get your projects out. The nice thing about the roll up door is that you can make huge projects. Even better, you can get them out when you are done. 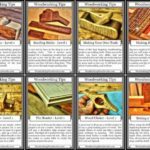 Lumber and sheet goods can come in very easily, and you can build larger pieces of furniture and get them out with ease. If you do end up sealing the door, you can install a bigger person door that will help get larger items in and out. Also, if you make smaller to medium sized projects anyway, this might not be a concern of yours at all. Either way, planning now will make it less of a hassle later. Find a place in your shop where you can create a lumber storage area. Make that a dedicated area for all of your wood. This is great for a couple reasons. First, because it helps you stay organized and it keep everything in one place. When you have your lumber all spread out, it can be hard to know what you have. You end up buying wood that you already own, wasting time and money. When you have a special garage storage area for your wood, you have a better view of your stock, and an easier time picking out wood for your projects. Also, when you only give yourself a smaller area for wood storage, you end up forcing yourself to become organized. After all, you can’t just pile it everywhere like before. You need to think about areas for larger stock, medium, and finally smaller bits. As you organize, you will have a better understanding of what you have on hand. 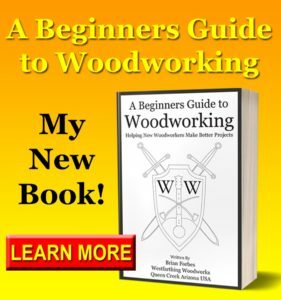 Safety gear is very important in any woodworking shop, and the garage is no different. You should have a way of addressing fire, first aid, emergency assistance, and more. From woodworking to diy projects, you never know when you are going to get hurt. Depending on the tools that you use, be sure to look into your specific needs for safety gear and emergency equipment. It depends on what you make too. 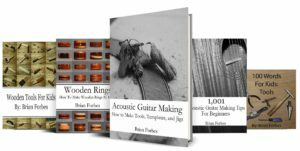 My recommendations work for me and what I make, but you may need more or less. Start with a good fire extinguisher. Then, add in a first aid kit that covers anything you might need in your shop. This can be cuts, bruises, bumps, or burns. There may be more, so get a comprehensive kit and be on the safe side. You can even hang or mount this kit on the side of the workbench. This way, you always have it handy. Being the same same spot matters too, that way you don’t have to hunt for it in an emergency. After that, figure out your emergency contact plan. This is how you are going to make contact with ambulance or fire in the event you need them. Remember, you might not be able to make a phone call if you have a serious injury. Don’t count on the ability to self rescue all the time. It’s important to have someone to check on you, or that you check in with after each solo shop session. This way, there is at least one more person looking out for you when you work alone. Before you need to run out of your shop, it’s important to know how. It’s also important to know where to go. This can be for a number of reasons, and a few of them are fire, allergic reaction, and fumes. When you are finishing, you can accidentally end up in a situation where the fumes are too much. At this point, you need to exit the room fast. This can happen even in a well ventilated room, it just depends on your sensitivity and the chemical itself. Plan your escape route long before anything bad happens. Also, make sure that you don’t litter the escape route with obstacles. Have a clear path out, and have alternative paths. For example, if your plan is to exit through your garage door, but the emergency issue has tripped the shop breakers, your garage door might not work. In that case, you need a secondary route out of the shop and to safety. Plan for everything in the beginning, because fortune favors the prepared. You may never need to put any of this into practice, but the time you do need to make a quick exit, you will be glad that you already thought about it. The last thing you want after a long career of woodworking is to have any respiratory health related issues from your hobby. Over time, and through constant exposure to saw dust, you can develop many unfavorable lung conditions that can severely impact your quality of life. Large and small workshops can both benefit from this. Instead of waiting for that to happen, take some steps now and think about installing an air filtration system in your shop. This can be as simple as a homemade version with furnace filters, or it can be a store bought model. Either way, you should protect yourself. Very fine airborne dust can end up in the lungs easily. Sometimes, it’s hard for your body to remove it. After time, the accumulation causes health issues, and all because you weren’t thinking about the fine dust floating around in the shop. You can mitigate this dust with any type of collector that is rated for your shop size and activity level. Also, you can look into personal sir filtration systems that you wear. These are really cool devices that clip to your belt, and they supply filtered air for you to breathe. Personal air filters come in a number of varieties and price points. Look at the capabilities, and decide on a unit if you would rather protect yourself this way. Anything you do to reduce the amount of dust you inhale, the better. Depending on your seal at the bottom of your garage shop door, you might have some water enter your garage from under the roll up door. 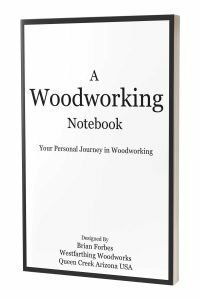 It’s important to design your shop so that if this does happen, it does not ruin your wood or tools. If you know that your garage door allows in water, then plan that into your shop layout. If you don’t, then plan it in just the same. You can also pay to have your garage door bottom seal repaired, which will help keep more moisture out. The last thing you want is to have a bunch of water come into your shop and then you have to dry out all of your wood. Rain water carries spores, which can cause mold, mildew, and other bad things for a sealed shop. Instead of running the risk, keep your tools and materials off the floor by several inches. This should be plenty in the event of a flood. Benches with bottom shelves can be made so that the shelf is a few inches off the ground. This extra room keeps them dry. It also gives you room to clean in the event of a small flood. You may want to also keep everything approximately four feet from the roll up door. This way, if some water does come in, it may never even touch anything. Also, you can more easily treat the wooden legs on your benches for mildew and mold after the water recedes. 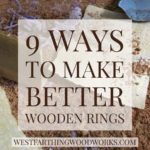 It will be a much easier project than drying out your wood pile, and trying to recover from everything getting wet. Now that you know what it takes to build a workshop in the garage, get off your computer and start planing. There is nothing more fun than woodworking. 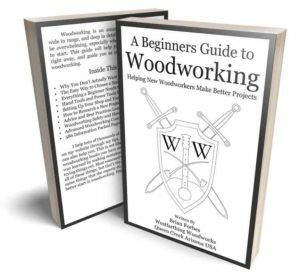 Once you have a good shop in place you will have a lot of fun making all of your projects. As you make that plan, think about the things that I mentioned in the post. Make them a part of your design strategy. Plan for lighting, outlets, climate control, and tool placement. All of these are important, and will leave you with a far better running shop. Your garage can be the perfect woodworking space if you allow it. Do what you need to make the space work, and don’t stop until you are happy. It may take you a little time, but you will be very happy. Small things make a big difference. 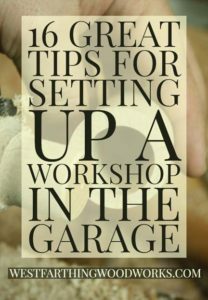 If you have any questions on 16 Great Tips for Setting up a Workshop in the Garage, please leave a comment and I will be glad to answer them.